Ella Bessie Harper, widow of Clarence Harper, passed away peacefully at the age of 100 at the Kiwanis Nursing Home, Sussex on Thursday, January 10, 2019. Born in Anagance where she lived her life, she was the daughter of the late Harry and Frances (Bicknell) Dunfield. 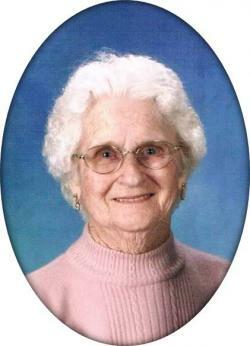 Ella was a homemaker, and a member of the former Anagance United Church where she enjoyed teaching Sunday School. She was also a member of the Anagance W.I. and Senior's Club and she enjoyed knitting and quilting. She is survived by her children Anne Teixeira (Joseph) of Brampton, ON, Eleanor Adams (Roger Smith) of Moncton and Harold Harper (Thérèse) of Anagance; grandchildren Ramon, Shane, Heidi, Sonya and Tyler; several great grandchildren and nieces and nephews. Besides her husband Clarence she is predeceased by brothers Robert, Donald and Everett Dunfield. Funeral Service will now be held on Tuesday, January 22 at 11 am at the Salisbury Funeral Home Chapel, 3350 Route 106 (372-4800) with reception to follow. There will be no visitation by request. Interment at Anagance Cemetery at a later date. If desired, donations to the Anagance Cemetery or the Canadian Cancer Society would be appreciated by the family.